A lot of the time, people don’t realize what Prime Insurance Company does. Everyone assumes we’re just the usual run-of-the-mill insurance company and that we don’t do anything special. We feel it’s really important to get out in the field and meet potential customers and spread the word about how unique we are as a business. Our specialty is insuring those that are considered high-risk or those that have previously been declined, non-renewed, or canceled insurance or just find it impossible to find. We want to make sure everyone can be covered – no matter what they do. One of the ways we like to get in front of people is by attending or exhibiting events, trade shows, and expos. These events are not only a lot of fun but also a fantastic opportunity to get in front of the people who would find Prime Insurance to be of benefit to them. People often prefer the relaxed atmosphere of these events instead of having to talk to us over the phone or come into the office, and we really like it too as it gives us the chance to meet our customer base. We love to have an informal and friendly chat with people about who Prime is and what we do. We also like to attend industry-specific events which allow us to get in front of insurance agents and industry professionals so they can see how our products and services might work for their clients. Most importantly, these events give individuals the information they need to insure themselves or their clients adequately before it’s too late. 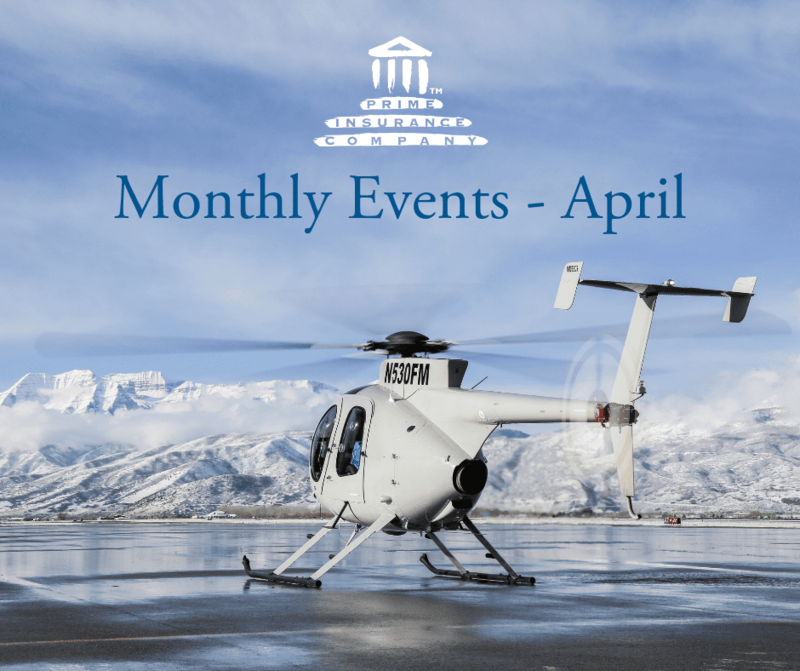 With April just around the corner, we have a couple of interesting dates in our calendar, and we hope you’ll be able to join us. If you do, please make sure you stop by our booth. We’ve always got an expert or two on hand ready to answer any questions you might have about us. What: This big event is the states largest industry trade show so a perfect opportunity for networking and discovering new products and developments within the industry. The two days are jam-packed with interesting and informative industry talks by experts as well as the many vendors showcasing their products. We at Prime Insurance Company are thrilled to be a part of this prestigious event and are looking forward to making new connections and meeting people within the industry. Pay us a visit. We’ll be in booth number 7. We hope that lucky number 7 will live up to its reputation and be good for you and your business. Our representative will be our SVP of Marketing, Rick Schaap. He is hugely knowledgeable about all of our products and is looking forward to talking to you. What: The MIIAB expo is the largest independent insurance agent and company expo in the midwest, so it promises to be a big and exciting event. It promises expert sessions from industry leaders as well as being packed full of interesting and informative seminars. Social engineering attacks – what will they think of next? Our booth will be staffed by our SVP of marketing, Rick Schaap. He’ll be on hand to discuss how our extensive range of products and services can help you. If you’re unable to attend either of these events for April then don’t worry, we have plenty more events lined up for the rest of 2019 and will be adding more throughout the year. Keep an eye on our events page to see where we’ll be in the coming months. While lots of people like to chat with us at events, plenty of people also just prefer to get in touch via phone or email. Call 801-304-5500 or email info@primeis.com to find out about Prime Insurances product lines. Alternatively, hop on to our Facebook page where you can keep abreast of our company news and events as well as send us a message. If you are more of a LinkedIn or Instagram person, we’re on these too! However and wherever you choose to get in touch, you will be guaranteed to be put in contact with a member of our highly experienced and friendly team. We pride ourselves on having the expertise you need to make sure you’re choosing the right insurance for you or your clients. If you would like any more information on the above events and where our booth will be situated, please give us a call, we’ll be happy to assist you. We’re looking forward to meeting you!